Bar snacks are making a big comeback. As the line between restaurant and bar becomes blurry it's now possible to make a meal out of small snacks. Heat a medium saucepan adding oil and beef mince. Cook on high heat for 5 minutes, breaking up the mince. Add onion, carrots, KNORR Professional Garlic Puree, KNORR Professional Ginger Puree and cook for 25 minutes or until liquid has reduced. In a separate saucepan, whisk KNORR Potato Flakes GF in warm water at 70 degrees. Add butter and stir to combine. Flatten 60g of mashed potato in the palm of your hand to make a 9 cm circle. Place 2½ teaspoons of filling in the centre and wrap the potato around the filling. Form into an egg shape and set aside. (Repeat with the remaining filling and potato). Place the balls in the fridge for 20 minutes to firm up. Place the flour, egg and KNORR Potato Flakes GF in three separate bowls. Roll the balls in flour, then dip in egg and coat in KNORR Potato Flakes GF. Heat 10 cm vegetable oil in a deep saucepan to 160 degree Celsius. 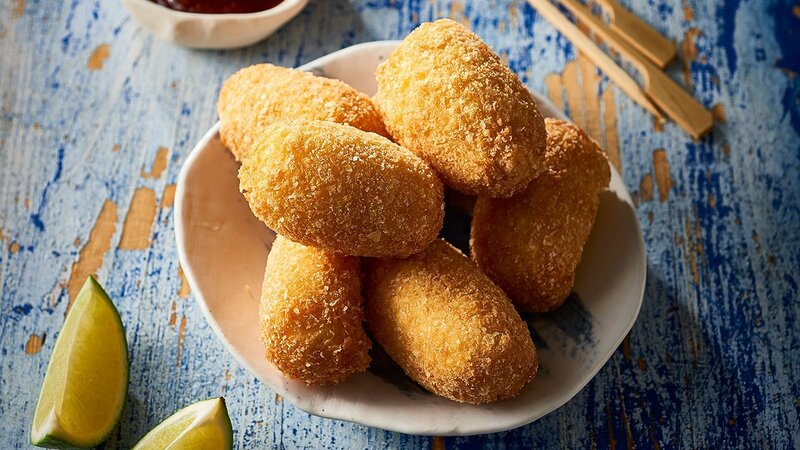 Deep-fry the croquettes, in batches, for 4-5 minutes until golden. Drain on paper towel.